2 Bedroom Flat For Sale in Yeovil for Offers in excess of £160,000. This stylish coach house is situated on the popular Wyndham Park development and is presented in excellent condition with modern fixtures and fittings throughout. The property offers spacious and flexible accommodation throughout in the form of: fitted kitchen with opening to the open plan Lounge/Diner, two good size bedrooms and a contemporary bathroom suite. There are numerous practical benefits to put a buyers mind at ease, including: remainder of NHBC guarantee, gas fired central heating, double glazing, allocated parking and a garage. Viewing is highly recommended. Presented with a stylish fitted kitchen offering a range of base and wall mounted units with worksurfaces over, comprising stainless steel sink unit with drainer and space for washing machine and fridge/freezer. There is also a radiator and the gas fired boiler is housed in the room. A light and airy room accessed via an open arch from the kitchen, offering two windows to front and a radiator. With window to front and radiator. With window to front, built in cupboard and radiator. With window to rear and contemporary white suite comprising low level WC, panelled bath with fitted shower attachment and tiled walls and a wash hand basin. 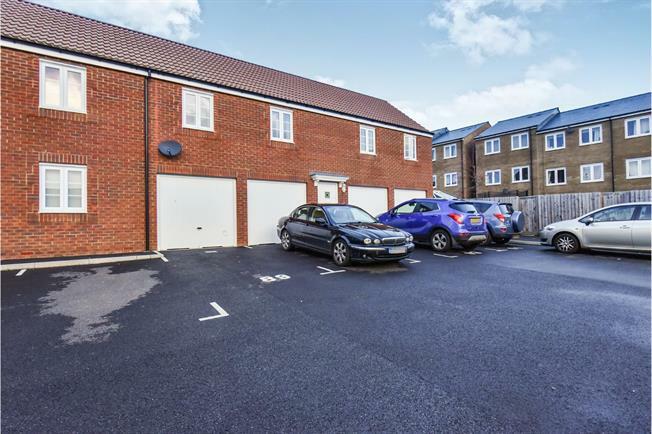 The property benefits from a garage and allocated parking.